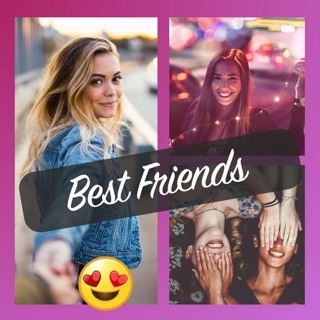 Amazing photo editor and collage maker to share your best moments and memories! Just back from holiday? Put your photos together easily and keep the holiday spirit on your social media account! Pick from the best basic and natural FILTERS to make your photos even more special. PicJointer combines powerful photo editing tools with awesome effects to wake up your creativity. Liven up your memories with hundreds of different FRAMES, STICKERS and FONTS! Mix and match them in any way you like using the COOLEST LAYOUTS. You won’t believe the art pieces you will create with just a few taps! PicJointer is the best photo collage app on the store with more than 5 MILLION installs all over the world. • ZOOM, PAN, ROTATE and MIRROR your photos to create the best combinations! • Use the easy PHOTO EDITING TOOLS to perfect your pictures. • Add colorful TEXTS with funky FONTS to make them even more expressive! • SHARE WITH ONE TAP on Facebook or Instagram to make sure all of your friends see your masterpieces! Ready for spring? Well, so are we! We just fixed a small bug, so it's time for you to go outside and play pick-up-sticks, because it's just that time of the year. And don't forget to choose some lovely frames for your Spring Break 2019 albums. I bought and paid for this app several months ago. It was my favorite go-to app for collage needs and I use it for my business. It had a very easy to use interface that I found preferable over other apps that do the same things. The latest update made major changes in performance and it is now difficult to use and simple things now require more steps. Very frustrating! The thing I’m most upset over is that even though I already purchased the app almost a year ago, all the features were locked and they now want to charge $4.99 a week to use it! NOT OK! I hit the button to “restore” my purchase so I have access to all the collages I did before, but now I’m afraid they are going to start charging by the week. I will delete the app and dispute the charges if this happens. I do not see a subscription listed in my iTunes acct so it’s kind of confusing. I want the app that I already paid for and I want it to function the way it did prior to the update... except minus the random crashes. P.S. The best thing about it was the ability to take a picture directly in the collage, that seems no longer possible in the updated version. Hello TheDivineMrsZ, considering you review, we understand that you are frustrated. First of all, we'd like to let you that if you already paid for the premium version of the app, when you tap "Restore Purchase" your purchase should be restored and you should gain access to all features and functionalities again. However, if this is not the case we'd be happy to help you find a solution. Also, we are pleased to inform you that since your review, we have been hard at work to polish the app and get rid of those sneaky little bugs causing the app to crash randomly. We honestly think that the app has improved significantly. But please send us an email to reviews@bendingspoons.com and we will help you personally, just write VIOLA in the subject line so we know it's you. In the info button (in the right top corner), it states that you have a 3-day trial, and goes on the say in the subscription details that you must cancel a subscription before you enter the last 24-hour period of the current subscription. That could mean you have only two days of your 3-day trial to look at the app before you will be forced into an automatic subscription. There are some “steps” provided on how to cancel your automatic subscription, but they are incorrect or incomplete, I tried then. I went to he app website provided here on the app page, but it is seriously just an advertisement about them, no additional help, FAQ, or additional support contact information, just the email address to contact them... will I get contacted before The app automatically turns into a paid subscription? I sent an email to support. But I am concerned that just deleting the app isn’t going to “free” me from their automatic renewal. I don’t know what to do, but posting a waning here seems appropriate. Perhaps support can clear this up for everyone interested. 1. Go to your phone Settings > iTunes & App Store. 2. Tap your Apple ID at the top of the screen, then tap View Apple ID. 3. Scroll to Subscriptions, then tap it. 4. Tap the subscription that you want to cancel. It sounds like your experience on our app was not very enjoyable which we apologise for as well as the lack of support you were provided with. We'd really like to make it up to you, so please send us an email to reviews@bendingspoons.com writing CAMEL in the subject field and we'll get back to you in no time. UPDATE: After searching for literally 4 months for another app as good as Pic Jointer USED TO BE, I had found nothing even close. So tonight I decided to re-download the app and try to learn how to use the new version. Upon re-installing, I found that it has been completely fixed since I left! Now, it could not be easier to use! I'm so thrilled that I can use this app again! ORIGINAL REVIEW: Wow! I cannot believe they really went and completely ruined my favorite app with this update! They've made the app completely unrecognizable from the greatness it was before. Everything is hard to do now. And most things that I want to do, can't even be done at all any more! What on earth were they thinking? I already uninstalled the app and will be looking for a different collage-making app today.